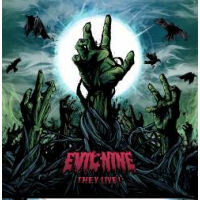 Album Review: Evil Nine, They Live! First things first: Evil Nine are really weird, even by tongue-in-cheek, old-school synth-driven, horror-movie loving European techno DJ standards. Combining an alternately hypnotic and humorous attack based very heavily on both hard and square-pattern leads, ascending pad lines and blatantly electronic four-on-the-floor beats, Evil Nine’s They Live! is expertly built for any combination of driving, clubbing, and strange hours of the night. Avant types beware: Evil Nine’s brand of weird is not an especially forward-thinking type. Indeed, with their 80s aerobic workout video beats and vocoders aplenty, the pair – producer/performers Tom Beautoy and Pat Pardy – wastes no opportunity to remind listeners of their European tradition and their breakbeat origins. At the same time, the breakbeat style that made them famous has become just that – an origin, not a continuation. The tracks nod to Euro-dance, but never really indulge in it. Rather, the two are closer to a rock band playing technoish music than a techno band playing rockish music, such as the driving opener “Feed On You” with its repeating synth and synth bass lines or the zombie stomp of the title track. What keeps They Live! from being just another overprocessed vox Euro disc is the duo’s constant willingness to change gears without warning. No sooner have they settled into a mildly comfortable pattern than they bust out the rolling snares and stop-start beats of “Ngempa Guzon” or the borderline drone metal stomp of “Behemoth” and “Born Again,” neither of which would sound out of place on a Jesu record. It would have been insanely easy for them to have crafted an album’s worth of Reason-by-the-numbers, but they wisely choose to listen to their inner John Carpenter and go over the top when need be. In the movie They Live!, Carpenter used a pro wrestler and intentionally cheesy effects to craft a strange hybrid commentary on politics and entertainment. With the highly listenable and mightily enjoyable album of the same name, Evil Nine don’t go quite as far but certainly can’t be faulted for not aiming as high.